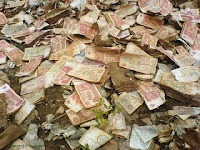 The graveyard of discarded fiat currencies: Heaps of Soviet-era rubles decompose in a landfill. Chances are the fraudulent instrument of debt called the "dollar" will soon reach the same destination. For decades, the American ruling establishment has enjoyed the privilege of exporting inflation. This has been done, acknowledges Ben Steil of the Council on Foreign Relations (a group I'm not in the habit of quoting favorably), by compelling other governments around the world to print huge mounds of their own currencies to prop up the dollar by buying Treasury Notes. Thus when the Fed inflates, central banks world-wide follow suit, thereby driving up consumer prices for those ruled by satraps of Washington's global empire. Not surprisingly, at least some of those on the unfavorable end of this equation are getting restive, which is why the Gulf Cooperation Council has been making noises about removing the "dollar peg" that holds this corrupt arrangement together. He just can't leave wretched enough alone, can he? The execrable Alan Greenspan at an investment conference in Saudi Arabia, urging the region's petro-oligarchs to abandon the dollar. Oh -- and wasn't it cute of Alan "I'm Forever Blowing Bubbles" Greenspan, addressing an investors' conference in Jedda, to advise GCC governments to drop the dollar peg in order to protect them from the consequences of his own inflationary policies? Foreign purchases of our debt bonds started to taper off three years ago. If the GCC governments act on Greenspan's advice, it will probably provoke a world-wide flight from the dollar and, in short order, the end of our status as a First World nation. I wouldn't blame the GCC or anybody else for bailing on the buck, of course. But it is indigestibly rich to see Greenspan wielding the pin that may be used to pop the dollar bubble he so diligently inflated during his term as Fed Commissar. To understand the likely consequences of the course Greenspan now prescribes, a different metaphor is called for. For decades, the fiat dollar has been the world's reserve currency, issued by the world's largest debtor. The results of this unprecedented combination were entirely predictable: Washington has generated a flood tide of inflation that has inundated more or less the entire world. A tide is a reciprocating phenomenon -- if it goes out, it must come back in. But how do we describe what happens when a relatively small stretch of coastline suddenly has to absorb the impact of every returning tide from all the world's oceans all at once? "Tsunami" is an entirely inadequate term. Well, in economic terms, we're going to find out, and probably sooner than any of us will admit. And auguries of this potentially apocalyptic development abound. For instance: "Euros only" signs have sprung up on the streets of Manhattan. No, this doesn't mean proprietors of small shops would flatly reject FRNs (Federal Reserve Notes) if offered in sufficient quality. It does mean, however, that with the inversion of the exchange rate in favor of the European Union's flavor of fiat currency, and the corresponding influx of European tourists, at least some small businessmen in New York -- particularly those who have traveled to Europe recently, and learned just how little a dollar will buy on the Continent -- are trying to avoid the hassle and stress of converting currencies. We'd better get used to that kind of thing. In fact, it would be a good idea for Americans to study what's happening to another dollar, the Zimbabwean variety. The regime led by the demented Marxist thug Robert Mugabe will admit to an official inflation rate of 100,580 percent in January, up dramatically from a more, ahem, modest rate of 66,212 percent last December. But unofficial -- which is to say, more reliable -- estimates put the rate at around 150,000 percent. 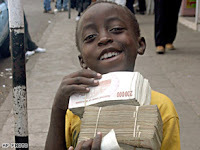 A millionaire street beggar in Zimbabwe displays bundles of that nation's increasingly worthless fiat currency. He has an endearing and radiant smile now, but the history of hyperinflation suggests this young man is in for incredibly hard times. Say a prayer for him. The typical Zimbabwean is a multi-millionaire: The country's per capita gross domestic product is $9 dollars (U.S.), or about 70 million of that country's dollars. But then again, a kilo of chicken goes for 15 million Zimbabwean dollars. While Zimbabwe's "millionaires" starve, its ruler and his posse feast. Amid chronic shortages of gasoline, food, and other essentials, the sub-cretinous hordes who compose that nation's ruling elite recently raised 3 trillion Zim-dollars to celebrate the Dear Leader's 84th birthday. Of course, we're not suffering Zimbabwe-style hyperinflation, at least not yet. But here's the cold, unyielding reality: As measured by our current account balance (which is not the sole definitive measure of an economy, I hasten to point out), our country is poorer than Zimbabwe, at least according to the CIA's World Factbook (a fact brought to my attention by the diligent folks who run the Freedom's Phoenix newssite). Of the 163 nations on the CIA's list, Zimbabwe is 95th. The United States is dead last. Our nation is broke in a way no country has ever been broke before. And as households, Americans are about to grow much poorer. Joseph Glauber, the USDA's chief economist, took note of a fact that should be obvious to anybody who's shopped for breakfast cereal recently: The price of wheat has surged dramatically, and stands at nearly $20 a bushel, an increase yet to be fully factored into consumer prices. As Lapp soberly pointed out, we're just at the beginning of this trend. And the kind folks at the United Nations, who never met a problem they couldn't transform into a crisis, or a crisis they couldn't nurture into a full-blown humanitarian catastrophe, is reportedly drawing up plans for food rationing in urban areas should commodity price inflation go hyperbolic and food riots ensue. Of course, this kind of thing would only happen in desperately impoverished countries without the means to meet the obligations imposed on them by their governments, and whose populations can't afford to buy food. You know, countries like Zimbabwe today ... and perhaps the United States in the near future. Liberty in Eclipse is on sale now at The Right Source. *I experienced a moment of mild and bitter amusement reading this observation in the Post story: "U.S. currency is the only legal tender money in the United States, but parties can agree to satisfy a debt by other means." Oh, really? Well, what if the parties agreed to an exchange of goods for Liberty Dollars, which are either made of, or fully redeemable in, the only constitutionally permissible money -- gold and silver? The Feds regard an equitable transaction between fully informed parties that involves real money to be a species of "forgery." What the Post meant to say, apparently, is that parties are free to conduct transactions using other fiat currencies. I once remember listening to Wayne Hage talk about the issue/evils of Federal land ownership at a Constitution seminar. What really jumped out at me was the point he made that all of the lands (BLM/USFS/NWR etc) have been used as surety against the debts held by foreign nations. I am convinced the push that has taken place over the last thirty years to lock up the resources of these federal lands is really due in part to the demands placed on us by the foreign govts. who hold our debt. The "spotted owls" and "kangaraoo rats" are jsut a thin smokle screen. Once our dollar has been declared worthless and we as a nation have fully defaulted on our debts then the lenders will demand compensation. Whereupon will have 100s of million of acres -chalk full of natural resources- to give to them to plunder. If boobus americanus is worried about the fate of the chinook salmon today wait until an entity of the chinese government is mining away. Environmental safeguards what safeguards? - you are now our resource colony . Shut up and get used to it or else your goose stepping govt will have you hauled away to one of their new detention centers. Ahhh the world "economy" circa 2009. Enter Rothbard on the foolishness of the official policy (Or is it intentional? ):"It might be objected that depression only began when credit expansion ceased. Why shouldn't the government continue credit expansion indefinitely? In the first place, the longer the inflationary boom continues, the more painful and severe will be the necessary adjustment process, Second, the boom cannot continue indefinitely, because eventually the public awakens to the governmental policy of permanent inflation, and flees from money into goods, making its purchases while the dollar is worth more than it will be in future. The result will be a "runaway" or hyperinflation, so familiar to history, and particularly to the modern world. Hyperinflation, on any count, is far worse than any depression: it destroys the currency — the lifeblood of the economy; it ruins and shatters the middle class and all "fixed income groups"; it wreaks havoc unbounded. And furthermore, it leads finally to unemployment and lower living standards, since there is little point in working when earned income depreciates by the hour. More time is spent hunting goods to buy. To avoid such a calamity, then, credit expansion must stop sometime, and this will bring a depression into being." Very scary stuff. I wonder who will get to buy this country wants it has to be liquidated? Any thoughts on that Will? I assume China is most addicted to our debt. Never really thought about any others though. this solution to this horrible problem? "As for the United States, it needs to perpetuate the sound money policies of former Federal Reserve Chairs Paul Volcker and Alan Greenspan and return to long-term fiscal discipline." Paul Volcker, maybe. But a man who regards Alan Greenspan as an exemplar of "sound money policies" is clearly out to lunch. Steil's agenda, as I read it, is to consolidate the world's cacaphony of confetti currencies into three big ones; the dollar, the euro, and a newly-minted Asian unit. Then (although Steil discreetly doesn't venture there), the final three would be consolidated into a single global currency under a to-be-announced CFR plan. Will's instinctive sense that the CFR is a deadly snake-in-the-grass is quite accurate. Anyone who praises Al "One Percent Forever" Greenspan is part of the problem, not part of the solution. The Federal Reserve is an engine of inflationary war finance, pure and simple. The Depublicrat War Party has no intention of stopping the inflation, now or ever. Welcome to Zimbabwe, comrades! Anybody that stores their wealth in dollars while the FED and the government steal it through currency debasement will end up like an Argentinian in the late 1980's. Buy gold and protect your wealth from your government. I'm embarrassed that I only just realized this: that our debtor to and hegemony of all nations status is can only be maintained by use and threat of military force. To be sure there are "Jacksonian" political officials, such as Huckabee, who truly believe that the U.S. should be absolute ruler of the world, but those intelligent and honest enough to realize that idea is unrealistic, know that our status and lifestyle can only be maintained by the illusion that this is the richest nation on earth. The government is in a poker game without even a pair twos, but still bluffing and betting the whole house with everything in it. Our ruling class surely realize that if we don't continue to "project power" (kill and main) over the whole of the earth, the world will call their bluff and the game will be up. They seem to think either this bluff can go on forever, it can't because we're already giving tells (Iraq and Afghanistan), or they just don't care because they won't be effected anyway. I really like your blog. I just started one for the first time. Check it out and give me some constructive criticism on it. Makers vs. Takers: A Firebell in the Night?